Features & Your Benefits: Stand up when you read this! ^BOOST^ Height Adjustable Workstations help you concentrate and be more productive. How? By adjusting vertically from 28” to 50” with electrical motors transitioning from a sitting desk, to a standing desk. Your benefits are reduced stress and fatigue compared to people who remained seated. So why is this a big deal? When we sit our bodies behave differently: Our muscles electrical activity drops, which in turn causes a multitude of harmful metabolic effects, such as sleepiness, and increasing the risk of diabetes. A sit stand desk reduces the blood sugar spike up to 43%, after lunch. Back Pain: Other important benefits of a standing desk are a reduction in back pain. A CDC study found using an adjustable standing desk reduced neck pain, and upper back pain by 54%, after just 4 weeks. Reducing Seated Time: Can improve physical, metabolic and even mental health. The positive factors of sitting less, and standing more, is an important healthy change. How much time should you spend sitting and standing? A 50-50 split is a good starting goal. Adjust as needed. How does that feel? 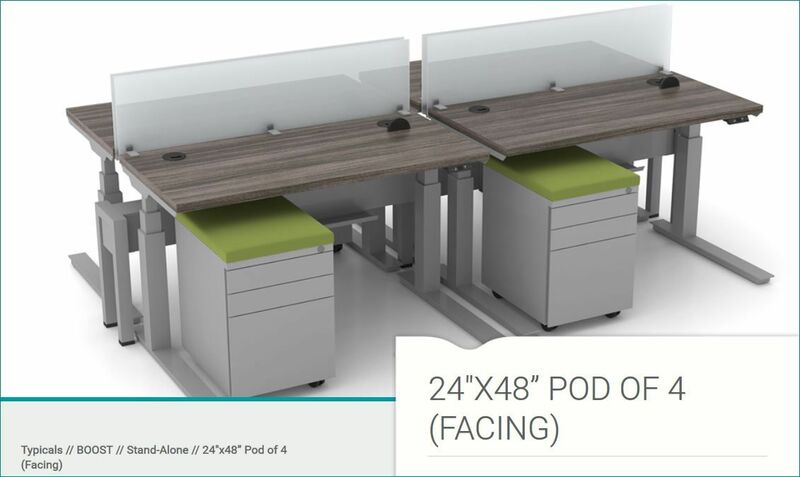 Included in this price: is the POD OF 4 FACING workstations, the Boost power, the data bridge (image above left), and free freight to the lower 48-states. Add the options above right you need to customize these standing desks to your specific needs. This is one of many possible design layouts. We can design a layout for your specific needs. To do this email us a CAD drawing of your room. Usually provided by your architect or building manager that includes the room dimensions, location of the doors, windows, and any vertical structural columns. A hand sketch with this information is OK. Takes up to 48 hours for us to produce drawings and a color rendering. Email your ideas to email Tom for a quote. Questions, phone home free to 1-877-550-2678. Ergonomic Home is an online furniture store since 1997 with 40 + years of office furniture industry experience. Framework Is Heavy Duty: 12-gauge and 9-gauge steel finished in Black, Silver, White. 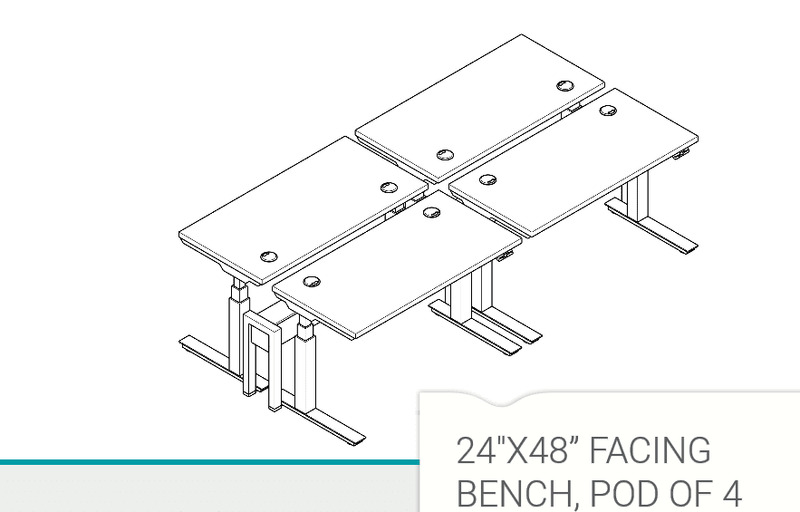 We will provide you with a layout drawing for your review and approval before order entry. Top/Surface Laminates: 1” thick thermo fused Melamine in electric white, sonic maple, or shadow elm, select above right. Green Factor: Frame is 95% Recycled Steel. Recyclability 100%. FSC Mix (Forest Stewardship Council) label means the wood within the product is from FSC-certified forests, recycled material, or controlled wood. Power: Includes a hard-wired in-feed bringing the building power from the wall to these standing desks. + Below-Surface Outlets (4x per Station) + Desktop Outlets (2x/Station). California Title 24 compliant. *NOTE: Hookup to your building power is not included in this price and is at your expense. Building wiring must be done by a qualified electrician according to national, state, & local codes. For a quote email Tom. Or phone home free to 1-877-550-2678. This is one of many possible design layouts. 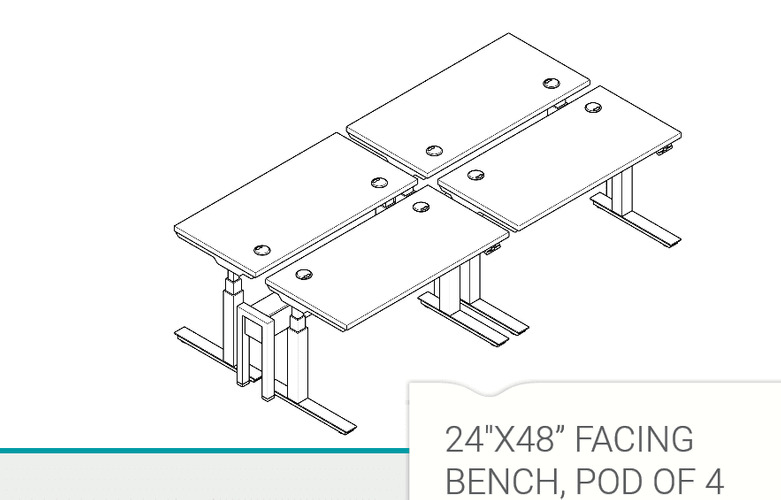 We can design a layout of adjustable standing desks for your specific needs. Review the PDF file below for examples of a 3-story building we did for a company in Houston, Texas. Ergonomic Home is an online furniture store since 1997 with 40 + years of office furniture industry experience. ErgonomicHome.com Delivery and Assembly Optional: Available in MOST, but not all areas of the lower 48-states. Here is what the service does. Are you hesitant to place a large office furniture order online not knowing how to put furniture together? Or whether the furniture will fit in your space? And, who will receive and install it? We offer a solution which is the optional ErgonomicHome.com Delivery and Assembly. First: Space & Product Planning. For your review, before ordering, complete 2D and 3D layouts with actual dimensions, considering physical conditions such as windows, doors and traffic flow. Secondly: Project Consultation. Our customer service teams are specially trained to project manage and see your job through from beginning to end. From initial product selection to post-ship satisfaction surveys, our attention to detail along the way ensures a positive experience every time. Thirdly: Expert Assembly in 10-14 business days after order entry. Your order is shipped to our installers warehouse, then they make an appointment with your company for delivery and assembly. To get these services select Deliver Assembly above right. © Copyright 2018 ErgonomicHome.com, Inc. All Rights Reserved.